January 2012 – The little NEW sign next to the interesting looking donuts called Red Velvet. These donuts sat on the top rack, just inviting your to try one of these red donuts. 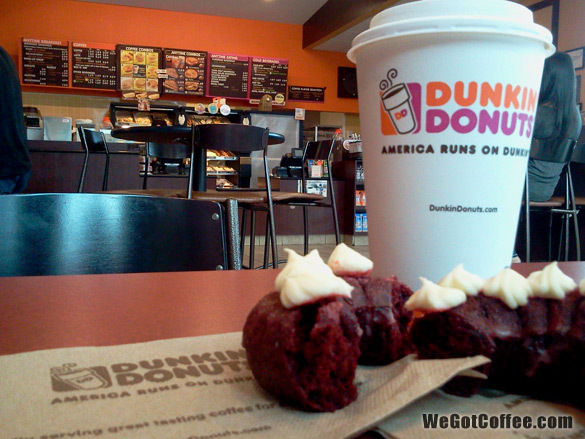 Of course you need to have the donut with a coffee! It was so-so. The frosting on top was mild and almost sugarless. The red velvet had a light taste, not vanilla, and not chocolate. Just sort of a ‘cake’ flavor. One of those donuts that look real awesome, but isn’t real awesome. Go for a fresh apple crisp donut!